Tendo city office have an enterprise to plant 100 cherry trees at a downhill of Mt. Maizuru as one of millennium project. From September 20, they recruited owners of cherry trees for a citizen. At first, they would finish to recruite on October 20. However, many many people apply for cherry trees at the same time when they started to recruit. Because they received over 120 applications, they decided to stop the recruitment. There are many applications because of marriage, birth of their child, memory of the sixtieth birthdays of their father, etc. They have a memorial tree-planting ceremony at 10:00 a.m. on November 12 at the Kitame area where they develop, at the east foot of Mt. Maizuru. I think this is a very very reasonable shopping because we can look at a cherry tree all the time by only 20,000 yen without any work. Of course I purchased it, too. A citizen visit group carried out a report meeting party at the hotel "Takinoyu Hotel" in Tendo spa(Onsen). They visited Marostica city in Italy as a sister city from Wednesday, September 6. At this visit, there are two important themes, an interchange of a citizen each other and a base camp invitation of soccer World Cup in 2002. About this theme, they visited an Italy soccer association to request directly and they were able to make a definite promise that the person in charge visits the prefectural sports park in Tendo for a inspection. In addition, the mayor of Tendo city Mr.Noboru ENDOH announced that he wants to invite a "Human Chess Game" in 2001, which is held in Marostica city once in 2 year, and examined whether it could come true including a respect of an expense. There will be an event of "Italy year in Japan" in 2001. An Italy embassy in Japan seems to hope to hold that event. The international interchange association of Tendo that sponsored a visit group to Marostica city, they will open a store at an industry exibition of Tendo "INDEX TENDO" on October 14 and 15, 2000. They offer Italian food, sale Italy products and have an photograph exhibitions of "Human Chess Game". 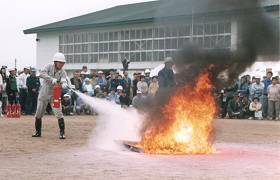 In Japan, September 1 is designated annually on "a day of protection against disasters." It was late for a month from this day, we have a protection training against disasters in Tendo. They carry out this training different place every year, this year they have a training at Araya area located in a southeastern department of Tendo. 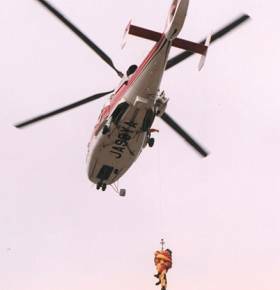 Various kinds of groups participate in this training, not only members of a fire department but also inhabitants of the district, a fire-fighting unit of a district, a women's association, etc. 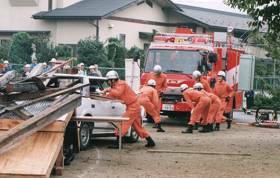 The training began by the assumption that a large-scale earthquake occurred at past 8:30 a.m. and they carried many various training. In Japan, a big earthquake attacked Kobe city of Kansai district(the Great Hanshin Earthquake) on January 17, 1995. Time more than 5 years goes by from that big earthquake, a lot of people has faded a sense of impending crisis to natural disaster. It is necessary at the earliest for two or three days so that water service or electricity restore when I look back on the various kinds of disasters that happened till now. Tendo city office presents a bag of protection against disasters to the people who moved into. Would you check a bag once again and try to prepare water or food?